Followers of Yahweh ben Yahweh know this to be true: the events described in the New Testament didn’t happen around 1900 years ago – they occurred in modern times. The word “new” means refers to something or someone who never existed. 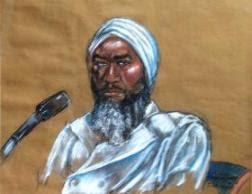 If you watch the TV program, The Universe of Yahweh ben Yahweh, you will learn that YbY is the Messiah, that his “judicial crucifixion” was predicted in the New Testament. In her book, Kooks, author Donna Kossy describes many different leaders and thinkers on the fringe. Spotlighted in the chapter Black Messiahs, the rise and fall of Yahweh ben Yahweh (AKA Hulon Mitchell, Jr.) from the late 1970s up to 1995 is detailed. His religious following grew into a financial empire with motels, food markets, and other real estate holdings in the Miami area. While such success exuded positive vibes, there was dark side to the Nation of Yahweh. The Messiah and some of his followers were charged with extortion and even murder. While he was found not guilty of some charges, enough stuff stuck to YbY that sat in prison from 1990 to 2001. Suffering from prostate cancer, he was released early from his 18-year sentence, dying in May 2007. He had been convicted under the RICO law. Falsely convicted, according to the TV series that continues his work. The Universe of Yahweh ben Yahweh is hosted by an earnest narrator, a well-dressed young man. He explains how the Messiah was set up by the feds. Part of the evidence is the New Testament, as interpreted in an extraordinary exegesis. At the beginning of each episode viewers are invited by the Earnest Narrator to join in by having on hand the Kings James Bible, several dictionaries, a synonym finder, Hebrew and Greek lexicons, a set of encyclopedias, and Strong’s Exhaustive Concordance. A line from the New Testament is para-parsed until it’s “true” meaning is revealed. One episode dealt with YbY being prosecuted by the state of Florida on two murder charges. By referring to various dictionaries, synonym finders, lexicons, maybe even cookbooks, it is “proven beyond a reasonable doubt” that this event had been prophesied in the NT. The upshot of the trial was that YbY was found not guilty on the first murder charge; therefore all charges against him were nothing or insignificant. “Mocked him” also is part of the prophecy. “Mock” means “to dismiss.” Prosecutor Janet Reno dismissed the second murder charge after the first one didn’t fly. But what about the phrase, “arrayed him in a gorgeous robe?” One definition of “array” is “to dispose.” “Dispose” means “to deal with conclusively” and “to settle.” The Hebrew word for robe means “Yahweh will liberate” and “liberate” means “to set free.” In December 1992, explains the TV narrator, YbY was set free from the two murder charges in Herod’s jurisdiction (the State of Florida), the matter was settled. Ergo, the Messiah was arrayed in a gorgeous robe. The Earnest Narrator observes that this is another example of prophecy being fulfilled in detail with Yahweh ben Yahweh. As for me, after explaining that one bit of re-interpreted scripture as it pertains to YbY, I’ve got a headache. Simple. It’s rich in phlogiston, that alchemical sulfurous spirit. Ashes are left behind when all of the phlogiston has been used up. Or scientific thinkers used to believe back in the 1700s. In his book, The Ten Most Beautiful Experiments (2008), New York Times science writer George Johnson shows how some scientific theories held sway until researchers empirically proved they were bunk. Through his experiments Antoine-Laurent Lavoisier provided evidence in 1777 to the Academy of Science that oxygen, not phlogiston, made things burn. Before he left the scene he introduced the concept of an invisible substance called caloric, a subtle fluid that acted as the carrier of heat. But James Joule disproved that idea during a presentation at Oxford in 1847. He demonstrated that energy, not caloric, was the force behind a horse pulling a wagon or a steam engine pushing a piston. Another concept that bit the dust was aether. Scientists noted that light beams created interference patterns when they overlapped. This meant that waves were involved. But what was creating the waves? There had to be a universal medium that was spread throughout the universe in the spaces between stars and atoms. The Earth was traveling through the aether as it orbited the sun. Ergo, at times it must be crossing against the aetheral current. In 1887 researchers A.A. Michelson and Edward Morley set up a tabletop experiment to prove that light doesn’t travel at the same speed in all directions due to aetheral drag. They took careful measurements – and found nothing. The light beams maintained a constant speed. It was kind of a drag when they discovered no drag. As George Johnson points out, the speed of light, not aether, is the universal standard. 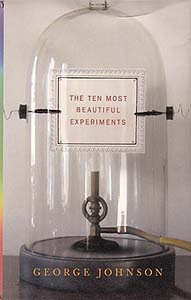 I’m glad I read Ten Most Beautiful Experiments. It provided a historical perspective that backs up my personal viewpoints. When a scientific or skeptical expert declares that all paranormal events aren’t extraordinary – they’re just the ordinary misunderstood -- such a person is blowing a lot of hot phlogiston, his head is stuck in the aether.